What’s The Best Height Adjustable Desk? Looking to buy height adjustable desks? Need some more information about the best types of sit/stand desks? Read on. There is plenty of information available online regarding the multitude of ways that sit/stand desks are beneficial for both staff and employers. However, there isn’t much information about what the best type of height adjustable desk may be for your business. We won’t cover all of the specific benefits that height adjustable desks can offer, as this information is easily found, however, we will say that keeping the body moving throughout the day is one of the best ways to improve concentration and productivity and avoid the development of musculoskeletal issues. There is a wide range of factors that need to be considered when looking to purchase height adjustable desks. These factors are often overlooked by consumers and this leads to dissatisfaction and inefficient use further down the line. It also causes many to believe that sit/stand desks are an unsustainable “fad” for the workplace. Here, we aim to help you to choose the best type of ergonomic sit/stand desk and explain why this choice is most likely to have the best impact on staff health, well being and productivity and thus, the best ROI for your business. Manually adjustable sit/stand desks are generally operated by a crank handle. This adjustment operation is almost always slow and laborious and often people will simply just stop adjusting the desk, particularly if it is intended for use by a sole individual. In the case of electronic height adjustable desks, there are a range of factors to consider before purchase that could cause issues with usage and integration. Electronic operating motors can be noisy both when in use and when idle. A common complaint is that even when not being actively adjusted, the motor will make an annoying humming or buzzing noise which is particularly noticeable in quiet working areas of offices or in libraries. Motors also run the risk of failure. It’s not common but it is a problem that can occur and if it does it has the potential to put the desk out of use until fixed. Motor failure is particulalry problematic if the failure occurs during an adjustment as the desk will end up at an awkward and unworkable height. Multiple and frequent adjustments can wear the motor out or cause it to overheat. This is a particular issue in areas where the desk is shared by multiple users or is in a more public environment. Electrical sit/stand desks will need to be placed within the vicinity of a power outlet and there is also the issue of additional cabling to address. The placement of desks that are required to have direct access to power means that re-configuring your office space becomes much harder so your layout becomes very fixed. Making the change to using a height adjustable sit/stand desk can be uncomfortable and hard to become accustomed with for new users. The change requires the user to form a habit of changing between sitting and standing regularly in order to reap the intended benefit of the desk. Having a desk that is quick and easy to adjust, will help to make the process less of a struggle and habit forming easier. As with the point above, people should neither sit all day, nor stand all day so regular adjustments throughout the day are unavoidable. If adjustments are slow, noisy or take a lot of effort, people will simply stop changing the height and the desk’s function becomes obsolete, along with the business’ ROI. 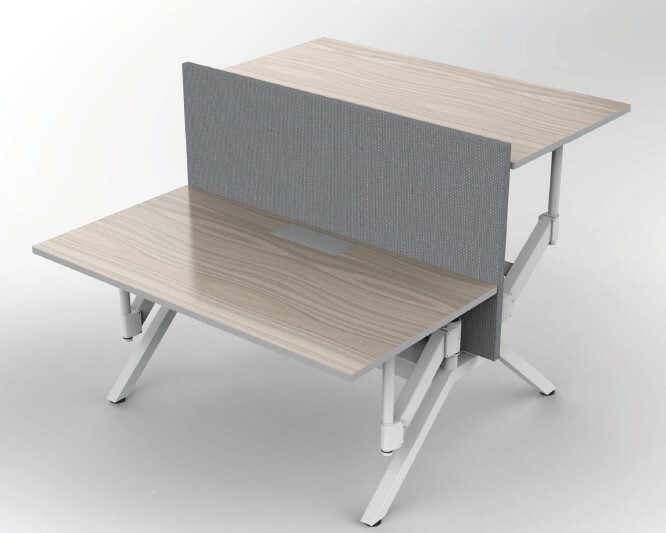 Transform, is the first gas assisted height adjustable desk to come to market. This simple method of adjustment – that has been implemented in chair design for decades – could actually solve many of the issues relating to the use of sit/stand desks and their effective integration into the workplace. The desk requires no electrical power and doesn’t rely on a crank handle. The gas assisted adjustment is smooth, quick and requires only fingertip touch from the user. The height is set by applying a brake to keep the desktop in place. Transform boasts a 700-1500mm height range and is available in 1200, 1400 and 1600mm top lengths. Transform is a logical and practical advancement on the height adjustable desks that are currently on the market. 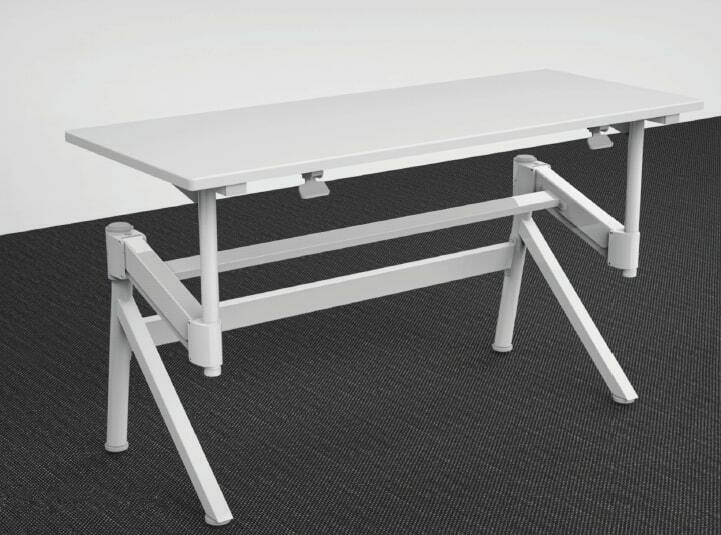 It solves all of the problems outlined above and is a worthwhile investment for businesses who are looking to introduce sit/stand desks into their work place.